Original Editors - Bellarmine University's Pathophysiology of Complex Patient Problems project. Rhabdomyolysis is defined as a clinical and biochemical syndrome resulting from skeletal muscle injury that alters the integrity of the muscle cell membrane sufficiently to allow the release of the muscle cell content into the plasma. Due to the quick breakdown of the skeletal muscle there is a big accumulation of the breakdown products which can cause renal failure. The first known report of rhabdomyolysis occurred in Sicily in 1908 after an earthquake, this was also the first case of crush syndrome as well and was found in German military literature. While this was the first report there has been some speculation that there are references in the Bible about rhabdomyolysis during the Jews exodus from Egypt. It was described as a plague that occurred after a large intake of quail. A similar incident occurred in 1930 in the Baltic sea area where there was a large consumption of intoxicated fish. The focus of rhabdomyolysis really came about during World War II, especially during the bombing that occurred in London, where crush victims developed acute renal failure. Reports were also present during the Korean War as well as during Vietnam. During Vietnam the incidence actually decreased which is thought to be due to the faster evacuation techniques and improved fluid resuscitation to victims. On September 11, 2001 in New York City the twin towers collapsed trapping many victims under rubble. Hospitals were prepared to have dialysis ready the days following the attacks to treat the many victims to prevent renal failure. 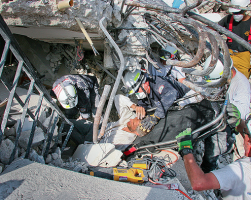 Fortunately, very few victims had crush injuries and the only victim developed rhabdomyolysis was a 38 year-old police officer who had been trapped under rubble for 24 hours. Eighty-five percent of victims of traumatic injuries develop rhabdomyolysis. Of those, 10-50% of those patients will develop acute renal failure. It is also suggested that victims of severe injury that develop rhabdomyolysis and later acute renal failure have a mortality of 20%. An estimated 26,000 cases of rhabdomyolysis are reported annually in the US. Men have a slightly higher incidence of developing rhabdomyolysis than women. Limited data exists on the prevalence of rhabdomyolysis in the pediatric population. The incidence of rhabdomyolysis in this population is estimated to be 0.26% (4:1,500 inpatient consultations) in a three year period at the University of California. Several small retrospective studies concluded that acute kidney injury rates in children admitted for rhabdomyolysis ranged from 42% to 50%, particularly when nongenetic chronic myopathies were evaluated. One other retrospective study included children with high CK after admission to the emergency department, excluding children with muscular disease, 5% developed acute kidney injury. Rhabdomyolysis occurs due to injury whether it is mechanical, chemical, toxins, poisons, or burns, these injuries have a detrimental effect to the cell membranes throughout the body. When a cell membrane is damaged the breakdown or lysis releases organic and inorganic intracellular components such as potassium, myoglobin, lactic acid, purines, and phosphate which enter the circulation. Exhaustive work of cells and stretching can increase sarcoplasmic influx of sodium, chloride, and water, which can result in swelling and auto destruction. After the restoration of blood flow after the injury these components become toxic to the body and in most cases are life threatening, making rhabdomyolysis a medical emergency. "Myoglobin levels rise within hours of muscle damage, but can return to normal in 1-6 hours if continuous muscle injury is not present." Courtesy Of: Efstratiadis G, Voulgaridou A, Nikiforou D, et al. Rhabdomyolysis updated. Hippokratia 2007; 11(3): 129-137. Myoglobin is usually filtered through glomeruli and reabsorbed in the proximal tubules by endocytosis, however when rhabdomyolysis occurs there is an excess of myoglobin, which overloads the proximal tubule cells ability to convert iron to ferritin, which then results in intracellular ferrihemate accumulation. Since iron can donate and except electrons as well as having the ability to generate free radicals the urine’s pH can lead to metabolic acidosis. This process puts oxidative stress and injury to the renal cells, which if untreated can lead to renal cell failure. When there is an excess of myoglobin the tubules are unable to reabsorb it. Systemic vasoconstriction sets in which results in water reabsorption in renal tubules, which then increases myoglobin concentration in urine. This in turn causes formation of casts that obstruct renal tubules. Another contributing factor of cast formation is apoptosis that occurs in epithelial cells. This obstruction causes formation of free radicals from iron, which can lead to renal failure. Potassium is another byproduct of muscle lysis. If there is too much potassium in the circulation then hyperkalemia can occur which is life threatening, because of its cardiotoxicty effects, this is a medical emergency. Cardiac arrhythmias can occur due to increased levels of potassium in the blood. In some cases, early death occurs due to ventricular fibrillation. Calcium accumulation in the muscles occurs in the early stages of rhabdomyolysis. Massive calcification of necrotic muscles can occur which can lead to hypercalcemia. If hyperkalemia is present hypercalcemia can lead to cardiac arrhythmias, muscular contraction, or seizures. Crush syndrome results in a characteristic syndrome of rhabdomyolysis, inducing myoglobinuric ARF, also known as traumatic rhabdomyolysis. Traumatic rhabdomyolysis results from muscle reperfusion with subsequent secondary systemic effects. These are direct and indirect consequences of prolonged compression on the limbs. The continuous compression results in destruction of the muscle tissue and subsequent compromise of cell wall integrity and leakage of cellular contents. The clinical presentation of crush syndrome is first based on the history of the event and a high index of suspicion. A compression of > 1 hr is likely to result in a crush syndrome, but this has been seen in as little as 20 min. The physical presence of trauma or local sign of compression (erythema, ecchymosis, bullae, abrasion, etc) on a muscle mass should be evaluated. The absence of a pulse or a weak, thread pulse to the distal limb may indicate muscle swelling or compromised circulation. Patients with crush syndrome have historically been described as presenting with muscle weakness, malaise, and fever. These symptoms may underestimate the real dangers which lie in the cardiovascular effect as a result of electrolyte imbalances and renal failure. Image Courtesy of Len Kravitz, PhD. 3. Early introduction of highly repetitive exercises like squats, push-ups and sit-ups. Speculation has been made that subjects with low levels of vitamin D are at higher risk for developing exertional rhabdomyolysis. Metabolic myopathies are a common cause of recurrent rhabdomyolysis post exertion. Most commonly including McArdle disease, and Carnitine palmitoyltransferase deficiency. Subjects at the highest risk for muscle hypoxia induced rhabdomyolysis include super obese male patients with hypertension and diabetes who have been in prolonged immobilization. This is commonly seen following long surgeries where the patient is immobilized on the operating table. In addition, other etiologic factors include a family history of muscle disease and consumption of certain drugs, notably taking a cholesterol lowering agent. Some genetic variations may predispose people to experience RM. Many of these variations result in a deficiency of enzymes important in ATP production or calcium handling. Abnormalities in glycogen or lipid metabolism result in a block of anaerobic glycolysis that predisposes to the loss of integrity of the sarcolemmal membrane and the liberation of myoglobin following exercise. These genetic factors may leave patients at an increased risk of developing RM because of a reduced ability to utilize glycogen to make ATP, a reduced ability to produce ATP from fat, and a reduced ability to re-form ATP during intense exercise. Patients with genetic induced rhabdomyolysis will present with signs and symptoms of their inherited disease but will also present with secondary signs and symptoms of rhabdomyolysis. These secondary signs and symptoms include: swelling, stiffness and cramping, accompanied by weakness and loss of function in the involved muscle group(s). Nonspecific systemic symptoms such as malaise, fever, abdominal pain, and nausea and vomiting, may also be seen. Occasionally changes in mental status can occur. Rhabdomyolysis may be secondary to electrolyte abnormalities. These electrolyte abnormalities include hyponatraemia, hypernatraemia, hypokalaemia, and hypophosphataemia. The proposed mechanism for this is cell membrane disruption as a result of deranged sodium-potassium-ATPase pump function. In addition, rhabdomyolysis can be caused by endocrine abnormalities such as hyperthyroidism, hypothyroidism, diabetic ketoacidosis, and non-ketotic hyperosmolar diabetic coma. The clinical presentation of metabolic and electrolyte induced rhabdomyolysis will be nonspecific and vary depending on the underlying condition. The clinician should monitor systemic signs and symptoms to help determine if further testing is needed. Rhabdomyolysis from alcohol is induced from a combination of immobilization, direct myotoxicity and electrolyte abnormalities (hypokalemia and hypophosphatemia). Cocaine induced rhabdomyolysis can occur through vasospasm with muscular ischemia, seizures, hyperpyrexia, coma with muscle compression, and direct myofibrilar damage. Statin-induced rhabdomyolysis may result from an unstable skeletal muscle cell membrane, the presence of abnormal prenylated protein causing an imbalance in intracellular protein messenger, and abnormal mitochondrial respiratory function caused by a coenzyme Q10 deficiency. The clinical presentation of drug and toxin induced rhabdomyolysis can vary due to the nature and side effects of the drugs and toxins themselves. Clinicians must take note of the signs and symptoms of the drugs themselves as well as monitor for additional signs and symptoms of rhabdomyolysis. As previously mentioned, typical signs and symptoms of rhabdomyolysis include: tea-coloured urine, muscle tenderness, swelling, stiffness and cramping, accompanied by weakness and loss of function in the involved muscle group(s). The signs and symptoms of rhabdomyolyis vary from person to person. The three most common signs and symptoms are muscle pain, weakness, and dark urine. Muscle pain as well as weakness and tenderness may be general or specific to muscle groups. The calves and low back are the most general muscle groups that are affected. According to the author Efstratiadis, back pain and limb pain are the most frequent sites in patients with rhabdomyolysis. However, over 50% of the patients with rhabdomyolysis may not complain of muscle pain or weakness. The initial sign of rhabdomyolysis is discolored urine which can range from pink to dark black. Other signs and symptoms include, local edema, cramps, hypotension, malaise, fever, tachycardia, nausea and vomiting. Often during the early stages of rhabdomyolysis the following conditions may also be present: hyperkalemia, hypocalcemia, elevated liver enzymes, cardiac dysrrhythmias and cardiac arrest. Some late complications include acute renal failure and disseminated intravascular coagulation. Blood samples are taken from the patient to look at various serum values, one of the most important serum indicators of myocyte injury is creatinine kinase. Creatine Kinase has several forms that include the muscles, heart, brain and kidneys, as well as mitochndria so it is important to look at all values. Uric Acid is important to check due to the fact that rhabdomyolysis breaks down skeletal muscle creating more creatinine, which then becomes creatinine which can then lead to acute renal failure, therefore causing the levels of uric acid to rise. 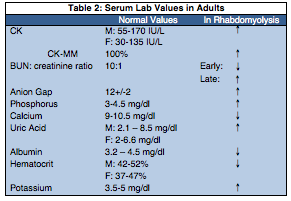 Urine analysis can be very helpful in diagnosing rhabdomyolysis. Urinalysis will be able to detect changes in the body’s waste, such as increases in uric acid, albumin, as well as myoglobin. Often patients that are positive for rhabdomyolysis have brown tinted urine. Table 3 has a description of common findings in urinalysis. Courtesy of: Vanholder R, Mehmet S, Erek E, Lameire N. Rhabdomyolysis. Journal of the American Society of Nephrology 2000; 1553-1561. Systemic involvement for rhabdomyolysis includes the muscle groups that have been directly involved such as during a crush injury or overuse. Once the breakdown of muscle occurs the by-product will then filter into the renal system, which if gone untreated can lead to renal failure. The best medical management for rhabdomyolysis is stabilizing the patient and aggressive fluid replacement with saline to preserve renal function. It is also suggested that fluids be given to victims before extraction. The increase in fluids helps to expand the intravascular volume, thereby inducing diuresis and clearance of toxins. It Is recommended that patients should be given 10 or more liters of fluid per day, so that they maintain a urine output of 150-300 ml/per hour. Sometimes mannitol and bicarbonate are given during the initial resuscitation. It is believed that mannitol acts as a free-radical scavenger minimizing cell injury. Mannitol is also a renal vasodilator to prevent renal failure. Bicarbonate is given to help correct the effects of metabolic acidosis and enhance myoglobin. Along with the patient’s vital signs and urine output, the patient’s electrolytes should be closely monitored. Monitor fluid intake and urinary output (urinary catheter insertion). Hemodynamic monitoring (central venous pressure measurements). Unfortunately, patients that have rhabdomyolysis are more likely to develop acute renal failure. A common treatment for acute renal failure is dialysis to correct fluid, electrolytes, and acid-base abnormalities. This is a slow process to correct the fluid overload and as well as removal of potassium and urea. A patient wil rhabdomyolysis will not take medications on a regular basis, they will only take them in the emergency medical treatment. However, patients are encouraged to drink lots of water throughout treatment. It is important to keep in mind the cause of rhabdomyolysis. It is important to not overexert the patient to prevent them from creating more muscle breakdown. The most important thing is for the patient to retain range of motion as well as to properly hydrate. The physical therapist treating a patient with rhabdomyolysis must make sure that the patient is not having any urinary problems which includes urine color. Some interventions would include range of motion exercises both active and passive, aerobic training, and gradual resistance training. A client’s fitness level is extremely important when considering the development of a workout program. Exertional rhabdomyolysis may occur when a client is not accustomed to the mode or intensity of the exercise prescribed. Fitness professionals must understand the importance of initial fitness level and progressional overload so that the exercise stress challenges the client appropriately. Fitness specialists should also consider the risks when providing eccentric training in a hot environment or if the client has any genetic risk factors for rhabdomyolysis. There is currently no evidence based guidelines for return to play after an episode of exertional rhabdomyolysis. However, a conservative return to sport protocol has been described by Consortium for Health and Military Performance (CHAMP) and is listed below. Image Courtesy of David C. Tietze, M.D. 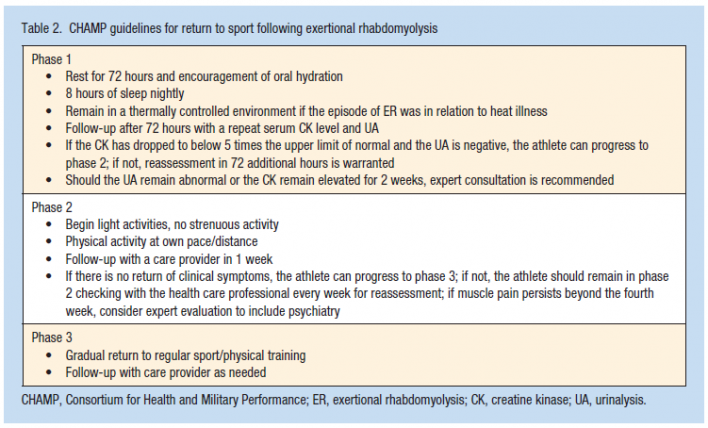 Schleich et al, outlined a phased reintegration program for safe and effective return to play post exertional rhabdomyolysis (table 1 below). Following phase IV, athletes in the study continued with agility work, speed development, and resistance training under the supervision of strength and conditioning staff. Each athletes return-to-play time will vary depending on severity of rhabdomyolysis, previous fitness level, training experience and maturation. According to O’Connor et al., an athlete who experiences clinically relevant exertional rhabdomyolysis (ER) should first be risk-stratified as either low or high risk for a recurrence. j. Serum CK peak ≥ 100,000 U·L−1. Complete history and physical examination should be completed and referral to experts for consideration of myopathic disorders before return to sport for any individual at high risk. , Cold exposure, Snakebite, Malignant hyperthermia, Muscle phosphorylase deficiency, Phosphofructokinase deficiency, Carnitine palmityl transferase deficiency, Phosphoglycerate mutase deficiency, Other inborn errors of metabolism, Hyperosmotic conditions, Guillain-Barré syndrome, Inflammatory myositis. Patient was a walk in to the US Military Academy Cadet Physical Therapy Clinic complaining of bilateral shoulder pain and weakness. The patient reported performing hundreds of push up of varying types 36 hours earlier. The patient reported being in pain and that he had noticed dark colored urine 24 hours after his push up session. Left elbow AROM and PROM were restricted to 90 degrees flexion due to pain and induration in the left triceps. Patient was diagnosed with Acute Exertional Rhabdomyolysis and was admitted to the hospital. He was given aggressive fluid replacement. While in inpatient he performed AAROM in shoulders and in elbows. Patient was discharged after 4 days and then returned to the outpatient clinic. Initiated once active ROM is normal. Upper body ergometer at low intensity for 5 minutes progressing daily until this workload can be maintained for 15 minutes. 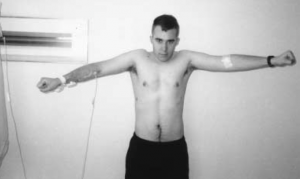 Initiated once the patient can maintain 15 minutes, on the upper body ergometer without discomfort, change in technique, or muscle soreness 24 hours post exercise. Progress to isotonic weight training with light weights for specific muscle weakness (ex. elbow extension for triceps), modified pushups, and bench press. Modified pushups are performed daily on an incline (such as against a wall) and progressed as tolerated to tabletop, stool, and floor (without modification). Initiated once patient progresses to pushups without modification. Patient is allowed to resume normal exercise routine with the restriction of only performing 1 set of pushups in any 24 hour period. This restriction in maintained until the patient is able to perform at their preinjury number of pushups without sequelae such as muscle soreness or loss of normal ROM. ↑ 1.0 1.1 1.2 Brudvig T, Fitzgerald P. Identification of Signs and Symptoms of Acute Exertional Rhabdomyolysis in Athletes: A Guide for the Practitioner. Strength & Conditioning Journal (Allen Press) [serial online]. February 2007;29(1):10-14. Available from: SPORTDiscus with Full Text, Ipswich, MA. Accessed March 23, 2014. ↑ 3.00 3.01 3.02 3.03 3.04 3.05 3.06 3.07 3.08 3.09 3.10 3.11 3.12 3.13 3.14 3.15 3.16 3.17 3.18 Efstratiadis G, Voulgaridou A, Nikiforou D, et al. Rhabdomyolysis updated. Hippokratia 2007; 11(3): 129-137. ↑ 4.0 4.1 4.2 4.3 4.4 4.5 4.6 Vanholder R, Mehmet S, Erek E, Lameire N. Rhabdomyolysis. Journal of the American Society of Nephrology 2000; 1553-1561. 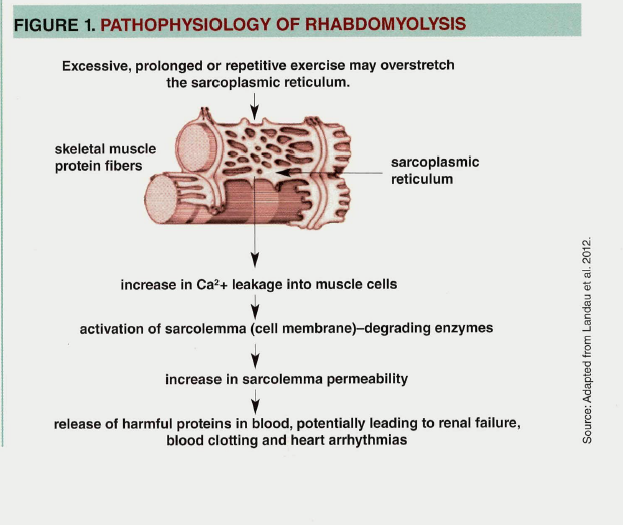 ↑ Harriston S. A review of rhabdomyolysis. Dimensions Of Critical Care Nursing: DCCN [serial online]. July 2004;23(4):155-161. Available from: MEDLINE, Ipswich, MA. Accessed March 23, 2014. 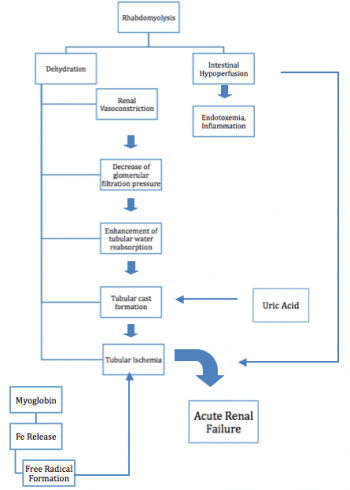 ↑ Al-Ismaili Z, Piccioni M, Zappitelli M. Rhabdomyolysis: pathogenesis of renal injury and management. Pediatric Nephrology (Berlin, Germany) [serial online]. October 2011;26(10):1781-1788. Available from: MEDLINE, Ipswich, MA. Accessed March 23, 2014. ↑ 9.0 9.1 9.2 Bosch X, Poch E, Grau J. Rhabdomyolysis and acute kidney injury. The New England Journal Of Medicine [serial online]. July 2, 2009;361(1):62-72. Available from: MEDLINE, Ipswich, MA. Accessed March 23, 2014. ↑ 10.0 10.1 10.2 Dario G. Crush syndrome. Critical Care Medicine [serial online]. January 2005;33(1):S34-S41. Available from: Academic Search Premier, Ipswich, MA. Accessed March 23, 2014. ↑ 11.0 11.1 11.2 11.3 Deyhle M, Kravitz L. research. Exertional Rhabdomyolysis: When Too Much Exercise Becomes Dangerous. IDEA Fitness Journal [serial online]. April 2013;10(4):16-18. Available from: SPORTDiscus with Full Text, Ipswich, MA. Accessed March 23, 2014. ↑ 12.0 12.1 Parmar S, Chauhan B, DuBose J, Blake L. Rhabdomyolysis after spin class?. Journal Of Family Practice [serial online]. October 2012;61(10):584-586. Available from: Academic Search Premier, Ipswich, MA. Accessed March 23, 2014. ↑ 13.00 13.01 13.02 13.03 13.04 13.05 13.06 13.07 13.08 13.09 13.10 13.11 13.12 13.13 13.14 13.15 13.16 13.17 13.18 13.19 Khan F. Rhabdomyolysis: a review of the literature. The Netherlands Journal Of Medicine [serial online]. October 2009;67(9):272-283. Available from: MEDLINE, Ipswich, MA. Accessed March 23, 2014. ↑ Bostanjian D, M.D., Anthone GJ, M.D., Hamoui N, M.D., Crookes PF, M.D. Rhabdomyolysis of gluteal muscles leading to renal failure: A potentially fatal complication of surgery in the morbidly obese. Obesity Surg. 2003;13(2):302-5. http://search.proquest.com/docview/821093760?accountid=6741. doi: http://dx.doi.org/10.1381/096089203764467261. ↑ Capacchione J, Muldoon S. The relationship between exertional heat illness, exertional rhabdomyolysis, and malignant hyperthermia. Anesthesia And Analgesia [serial online]. October 2009;109(4):1065-1069. Available from: MEDLINE, Ipswich, MA. Accessed March 23, 2014. ↑ Welte T, Bohnert M, Pollak S. Prevalence of rhabdomyolysis in drug deaths. Forensic Science International [serial online]. January 6, 2004;139(1):21-25. Available from: MEDLINE, Ipswich, MA. Accessed March 23, 2014. ↑ Janković S, Jović Stošić J, Vučinić S, Perković Vukčević N, Vuković Ercegović G. Causes of rhabdomyolysis in acute poisonings. Vojnosanitetski Pregled: Military Medical & Pharmaceutical Journal Of Serbia & Montenegro [serial online]. November 2013;70(11):1039-1045. Available from: Academic Search Premier, Ipswich, MA. Accessed March 23, 2014. ↑ Fda.gov. (2017). Stimulants Used to Treat Attention Deficit Hyperactivity Disorder (ADHD). [online] Available at: https://www.fda.gov/Safety/MedWatch/SafetyInformation/ucm446139.htm [Accessed 12 Mar. 2017]. ↑ Miller M, M.D. (2017). 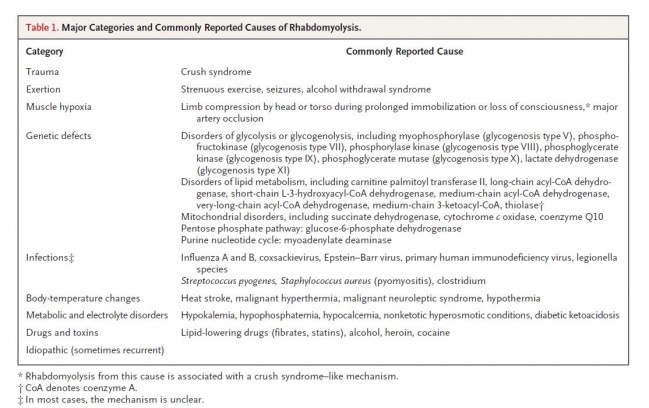 Causes of rhabdomyolysis. [online] Uptodate.com. Available at: http://www.uptodate.com/contents/causes-of-rhabdomyolysis [Accessed 10 Mar. 2017]. ↑ Torres-villalobos G, Kimura E, M.D., Mosqueda JL, M.D., García-garcía E, MD, Domínguez-cherit G, MD, Herrera MF, M.D. Pressure-induced rhabdomyolysis after bariatric surgery. Obesity Surg. 2003;13(2):297-301. http://search.proquest.com/docview/821093761?accountid=6741. doi: http://dx.doi.org/10.1381/096089203764467252. ↑ 24.0 24.1 Tietze DC, Borchers J. Exertional Rhabdomyolysis in the Athlete: A Clinical Review. Sports Health: A Multidisciplinary Approach. 2014;:1941738114523544. ↑ Schleich, K., Slayman, T., West, D. and Smoot, K. (2016). Return to Play After Exertional Rhabdomyolysis. Journal of Athletic Training, 51(5), pp.406-409. ↑ O'Connor, F., Brennan, F., Campbell, W., Heled, Y. and Deuster, P. (2008). Return to Physical Activity After Exertional Rhabdomyolysis. Current Sports Medicine Reports, 7(6), pp.328-331. ↑ Hannah-Shmouni F, McLeod K, Sirrs S. Recurrent exercise-induced rhabdomyolysis. CMAJ : Canadian Medical Association Journal. 2012;184(4):426-430. doi:10.1503/cmaj.110518. ↑ 30.0 30.1 Muscal E. Rhabdomyolysis: Differential Diagnoses and Workup. eMedicine 2009.